Howdy, folks! Hope you are enjoying your Labor Day festivities! This is Andy Larson, host of the pop culture love-fest we like to call, Ghosts of the Stratosphere. I’m back to temporarily interrupt your final backyard BBQs of the season to drop some much needed potato salad style comic knowledge in your laps and hope the mayonnaise doesn’t stain your shorts too much! Before I begin, however, with this particular week’s entree, I’d like to talk about the fact that this month’s read pile selections from yours truly will all have the same overall theme: Versus. Yep, given our last Ghost of Stratosphere episode might have signaled the death nail for that particular segment for future shows, I thought that it should symbolically live on at least for this first month of football season in my blogs by showcasing some of these style books that I have never read before. Plus the fact that regardless of who ends up winning these Versus, we all still win as we get to not only hopefully enjoy a pretty interesting yarn, but also be sparred from hearing that inevitable announcement that Rob Stewart won (no I’m not bitter or anything at my podcast co host over his impressive win streak at that segment…no sir). In any case, to start of this month’s series of books, I decided on one of the those often ill fated, much maligned, but for me, extremely fun crossover stories done between comics “Big Two”, Marvel and DC. Again some may just dismiss these as non canon dribble made solely for the purposes of scoring a quick buck on fans that have spent so many nights discussing whether the Hulk could really defeat Supes. However, I’ve always found them quite pleasant ever since I was introduced to my first one, the all time classic Superman/Spiderman team up, back when I was 8. For me, there’s something grand and downright magnanimous about these particular stories, when fans from both sides of this often immense divide can come together and root for their respective champions as well as the “other” guy. It reminds us that we are all part of one comic culture, and the wish that our comic characters could interact more often spreading good will and helping heal those artificial barriers we place around ourselves out of some ancient tribal necessity. Of course, the above panel of good cheer and camaraderie among super heroes isn’t from the book that I’m going to the reviewing today. That’s from the classic X-men/Teen Titans crossover from the early 80s done by Claremont and Simonson (which does star one of our two combatants, in the evil New God, Darkseid). Today’s book is actually done by the Claremont’s artistic partner on some of the all time classic X-men stories of all time: the legendary John Byrne. 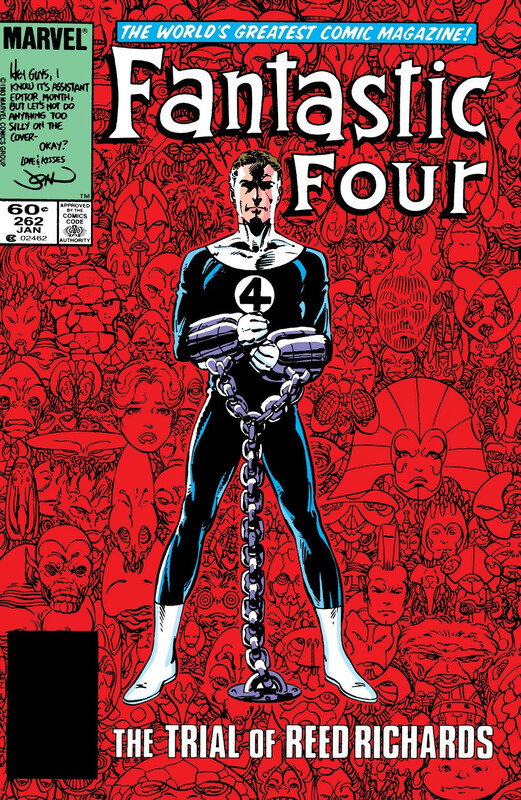 I’m a pretty huge fan of Byrne as not just an artist, but as a writer, with his run on Fantastic Four being one of the all time great series’ I can point to from the World’s Greatest Comic magazine. In particular, I liked the way he took the ground work started with Lee/Kirby’s run on FF, polished it, modernized it, and gave the readers back a more complete version of that original vision. I can think of no better example of this than his issue “The Trial of Reed Richards”, in which Reed is put on trial by the Sh’ir empire as well as other alien races due to his hand in saving the life of Galactus, the world devouring super being that caused much devastation throughout the known universe. This absolute classic of a story which in my opinion did a lot to humanize the godlike Galactus and his role within the greater scheme of the universal balance. 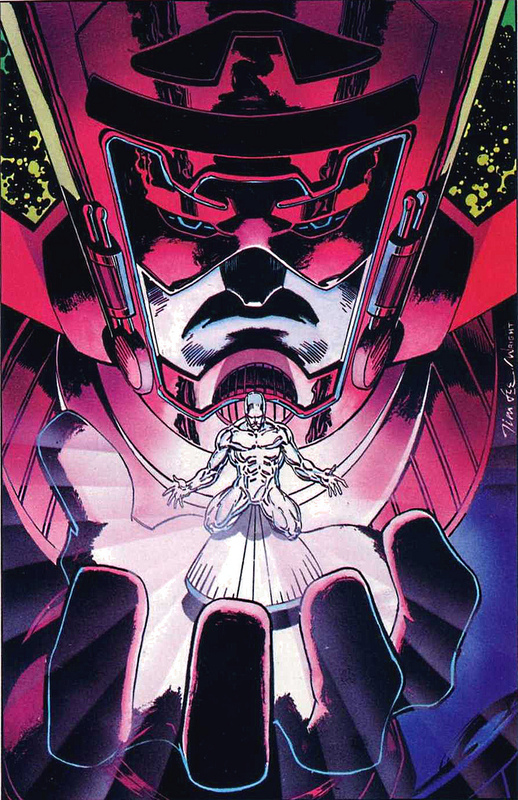 Byrne explains that Galactus is the sole survivor of the previous universe that existed before this one, and in surviving the previous “Big Crunch” and subsequent “Big Bang”, he was reborn into this one as a being entirely different than his previous roots. Through this rebirth, Galatus sacrificed his humanity in becoming a being bigger than just the simple morality of good vs. evil, but a force of nature, whose hunger is necessary to stabilize the cosmos as a whole, and therefore should not be decried as a being of heartless cruelty, but one that is simply fulfilling a role which the universe has deemed important for its survival. However, again, this book isn’t the subject of this blog’s read pile either. But if you take some of the elements of the two books I previously mentioned, the humanized Galactus character from the FF run, and the New Gods mythology running through X-men/Titans, you do end up at what could be the culmination of those two story ideas: Galactus vs. Darkseid. A book which on its surface just looks like a standard throw down between two cosmic level baddies, but as you read more, is actually a pretty great parable about the costs of survival and what beings will do to sustain their own. The Silver Surfer comes first, heralding the coming of the hunger. Someone inevitably wants to punch his chromed out face, with varying degrees of success. Galactus arrives and start slowly building his cosmic level George Foreman grill which will convert the planet into energy to sustain his hunger. Someone inevitably wants to punch him in his purple antlered face, with little to no success. Galactus is either occasionally routed through some sort of Deus Ex Machina, or in most cases, successfully has your planet for lunch. Rinse and Repeat with the next planet. And that’s how it goes with this tale as well. Galactus and Surfer show up at Darkseid’s planet Apokolips ready to nom on it. Darkseid grabs his proverbial shotgun and tell him to get off his land. He then tries to both punch Galactus with both planet sized rock creatures as well as his more formidable Omega Beams, and fails miserably. Darkseid’s enemies on Apokolips’ twin planet, New Genesis, sit back and quietly laugh at the good fortune that Galactus is playing interstellar Orkin man and is about to rid the universe of this planet sized cockroach. That is all but Orion, Darkseid’s secret son, who gets pissed off that nobody will have the honor to fight to protect the sovereignty of his secret Dad’s fiery mosh pit of a planet, and goes to punch Surfer in the face. Surfer quickly and near fatality settles his hash, with Orion only surviving thanks to his Motherbox. But Darkseid does take advantage of the fight to make Surfer remember he used to be Norrin Radd in some desperate attempt to have his herald fight against Galactus, an attempt that just makes Galactus pissed and sees Darkseid as the despicable creature he is, making him want to chomp down his planet even more. And in the end, he does. Darkseid fails to stop him. Galactus wins. Game. Set. Matc…wait a second. Yep, Galactus was given the bum steer. Darkseid’s planet has no life energy to give. It’s a barren rock for all intents and purposes. The Surfer was drawn to it like a moth to a flame and Galactus thought it possessed value due to the ferociousness defense Darkseid mounted to protect. Little did Galactus realize that Darkseid defended his dead world for no other reason than it was his, and he didn’t want some purple helmeted hooligan coming in and throwing his weight around on his turf. Yep, it was all a matter of pride, sucka. So Galactus revives the Surfer and they depart to find some other world, with Darkseid secretly knowing he could have just pointed them in the direction of New Genesis and used Galactus to wipe out his old foes. However, again, those are Darkseid’s foes, and for him alone the spoils of that victory shall go, just like his lifeless rock of a planet. It gave me a taste of what Marvel could have been had Kirby never left Marvel in the late 60s and joined DC. I say this because all of the characters in this book are Kirby’s creations. In fact, the New Gods were supposed to be Marvel characters to begin with, the continuation of a story line that Kirby had started in the Tales of Asgard supplemental stories included in his Mighty Thor run. But Marvel treated him badly, he jumped ship, and now all those characters belong to DC. However if that had not happened, this story would have easily happened in the mid 70s as Kirby continued to craft his wonderful space epics at the House of Ideas. I gotta say I feel almost cheated that history didn’t work out that way after reading this. It flies in the face of the notion that all of DC’s characters are way overpowered compared to Marvel, as both the Surfer and Galactus crush their opponents in this grudge match. Yeah! Take that, Stew! Marvel Rules! Most importantly, it’s another step in the continuation of the thought process Byrne started on his FF run, that Galactus, although an unstoppable galactic force of destruction, is still a character at heart, and is as a result capable of growth and dramatic potential. The scenes where he agonizes over the fact he knows the Silver Surfer will eventually someday turn on him and can do nothing to stop that, are ones of real tragedy, like those of a father that knows that his son will eventually betray him and yet must continue to love him as only a father can. Conversely, we see real anger from Galactus in his dealings with Darkseid, almost like a grown up that’s faced with a child that seems to act out of pure malice and spite, and the frustration that’s bore out of having to deal with chaotic illogical behavior. Sure, Galactus destroys planets, but he does so to live, not for pleasure or worse hatred. Darkseid does so for the opposite so it’s neat to see Galactus be the real hero of this story. So in closing, Darkseid vs. Galactus is a lot more than just another “Who would win?” postulating session between Marvel and DC fans. Like so many of these other Marvel/DC crossovers, there’s actually a good deal of substance you can get from these tales if you start peeling back the onion layers. This one in particular again more than some others because it finally brings back together a lot of Kirby’s children than should have never been apart to begin with and lets them play nice together, in a story that delivers a surprisingly large amount of drama and raw emotion from cosmic characters you would have thought were divorced from such notions. Kudos again to John Byrne on delivering another solid story filled with thrilling art, fantastic set pieces, and most importantly continuing to promote those really great ideas that were set down by “the King” so many decades ago.